Have any of you keyboard warriors tried to hop on UFC.com lately? If you haven’t, you’ll quickly discover that the website owned and operated by the planet’s premier mixed martial arts promotion has been hacked. The monkey business started on Sunday afternoon by “Underground Nazi H4ck3rGr0up.” The group is reportedly protesting the UFC’s public support of the Stop Online Piracy Act (SOPA) and PROTECT IP Act (PIPA), which would allow the US Government to shut down Internet websites that provide pirated content. The UFC contends they are losing millions of dollars each year from websites illegally streaming their pay-per-view broadcasts for free. With outrage coming from several major websites, including Google, Facebook, Wikipedia and Reddit, the House Judiciary Committee decided to postpone drafting the SOPA Bill last Friday. UFC.com had returned back to normal Sunday evening, but if you were to enter the domain this morning, the home page is now plastered with links to places fans can go to purchase tickets to UFC events. 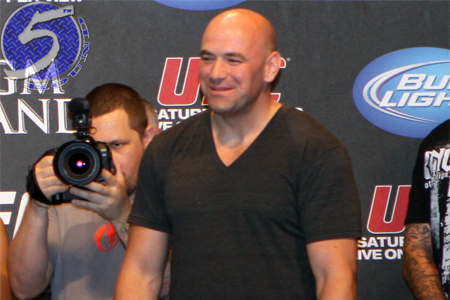 If UgNazi.com was looking to rattle Dana White’s (Pictured) cage, it appears the UFC president was more amused than upset. White’s beloved New England Patriots had just advanced to the 2012 Super Bowl when all of this madness was going down, so nothing was going to bother him following yesterday’s dramatic AFC Championship game.